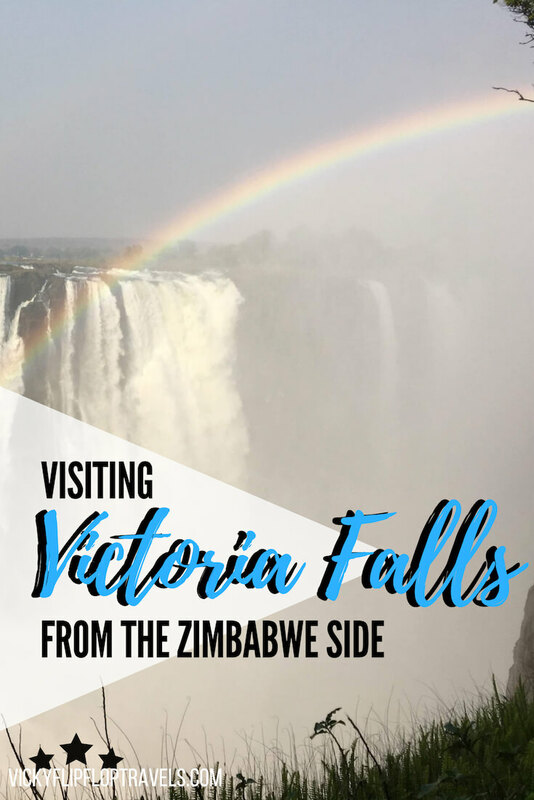 I wanted to visit Victoria Falls from the Zimbabwe side – it was kinda the whole point of including the country in my three-week trip to Africa. As one of the 7 Wonders of the World, and the largest waterfall in the world, I couldn’t really miss it when I was so close. 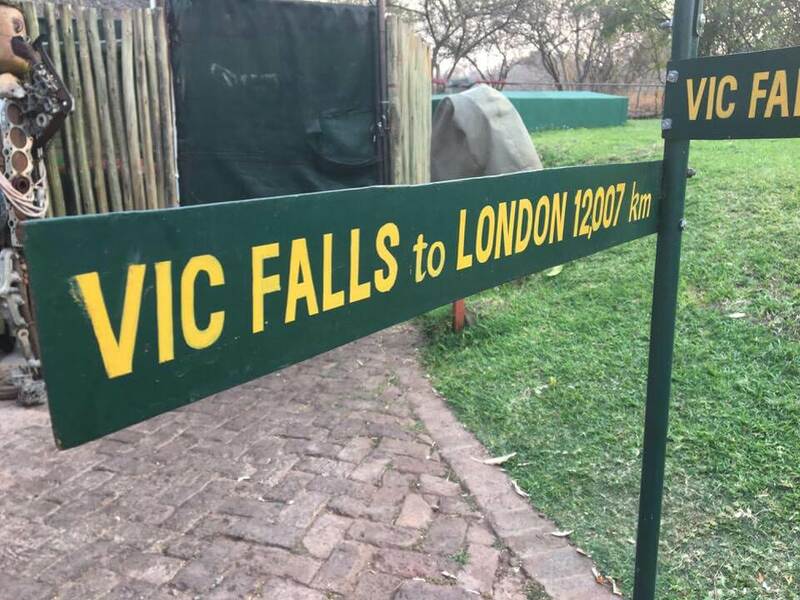 And so two hours after landing at Victoria Falls Airport – basic time needed for a catch up with my friend Helen, who I was out there to see – we were wandering through the entrance gates to the Falls. We chose to look round by ourselves, rather than have a guide. 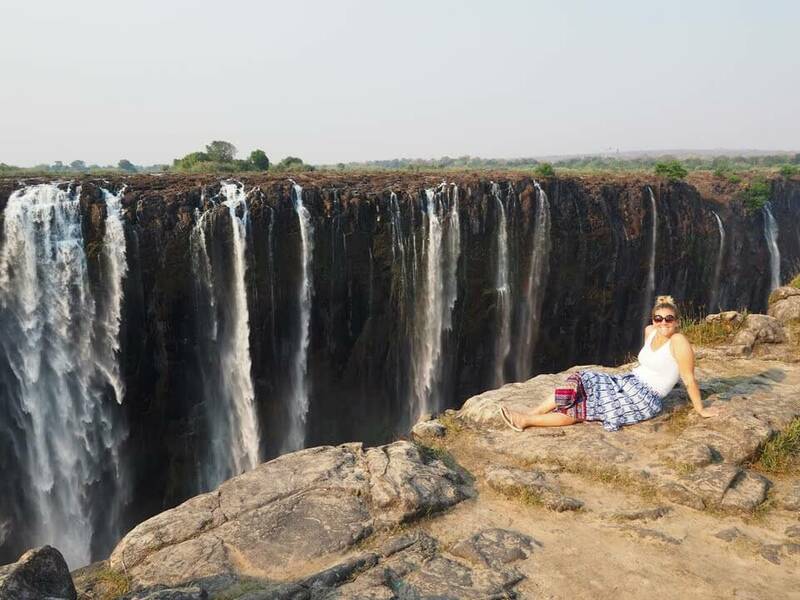 Despite her extensive travel in Africa Helen had never seen Victoria Falls from the Zimbabwe side, and I definitely hadn’t, so we wanted to have the time to take loads of photos and take it all in without a guide interrupting our flow. So, after carrying all my lenses and camera round, and then holding it up to take a pic I realising I’D LEFT MY MEMORY CARD IN MY COMPUTER back at the hostel – I was pretty gutted. And so the photos you see on this page are simply from my trusty iPhone 6. You’ll just have to imagine the epic shots I would’ve got (ha). 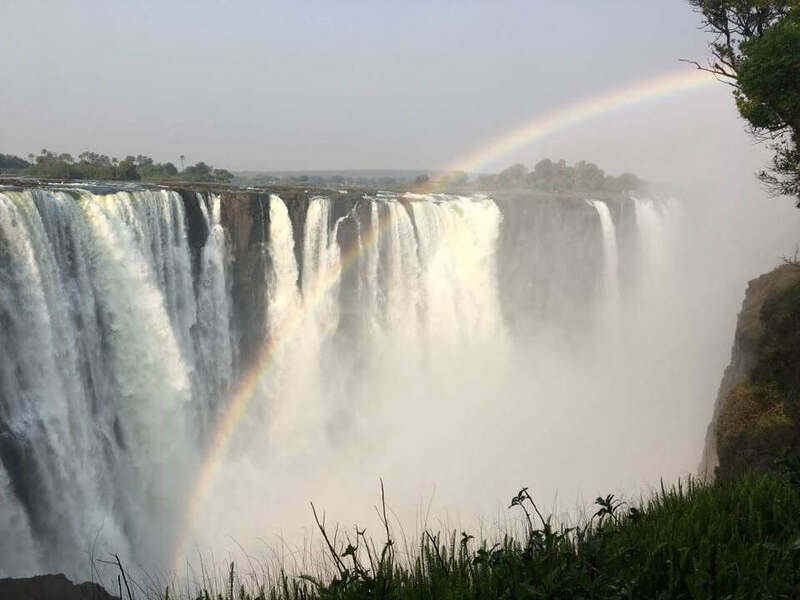 Anyway, the memory of Victoria Falls, with the elusive rainbow flashing across will be firmly imprinted on my mind forever. The further round we followed the path, the more impressive it all became. And, this wasn’t even the key season to see it. September to November, is in fact dry season, when the waters are at their lowest level. Apparently the Falls aren’t as impressive as the rest of the year. Imagine! 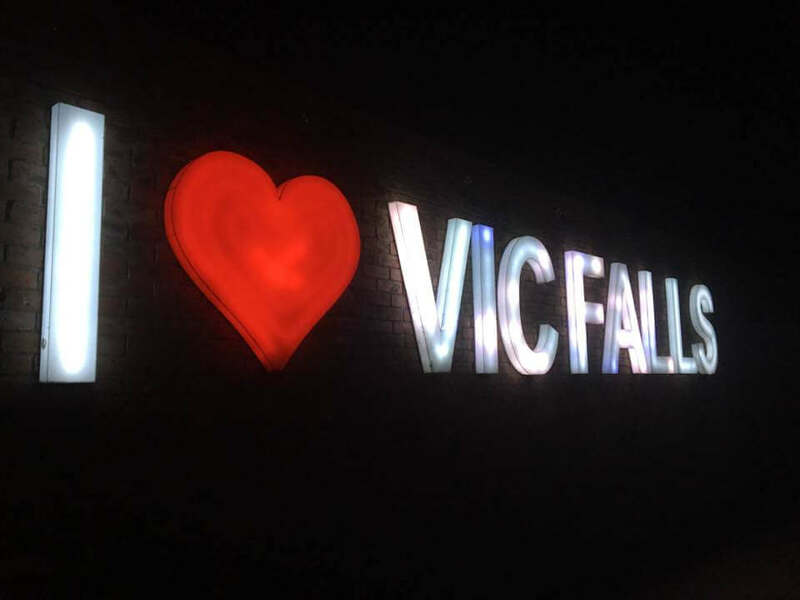 Here’s a photo I found from victoriafallstourism.org at peak viewing time, in April to June. We got to Danger Point, and just sat and admired the view down the Falls. I imagined David Livingstone coming across the Falls all those years ago, when he simply saw it as an obstruction to where he wanted to go. It took him a while to come round to realising the beauty of it all. One side belongs to Zimbabwe, and one to Zambia, with the famous Victoria Falls Bridge connecting the two. Anyone crazy enough can bungee off the centre, if they like. We saw the famous Devil’s Pool on the Zambia side, from the Zimbabwe side. That’s the pool where you see photos like this, of happy tourists genuinely risking their lives and apparently paying $190 for the pleasure of a dip in rainy season. And so, as the sun started setting we wandered back – not quite realising how far we’d walked round in all the excitement of each lookout point being better than the last. 2. The ‘Chain Walk’ – leads down into the gorge for the best view of Devils Cataract & Cataract Island. 6. 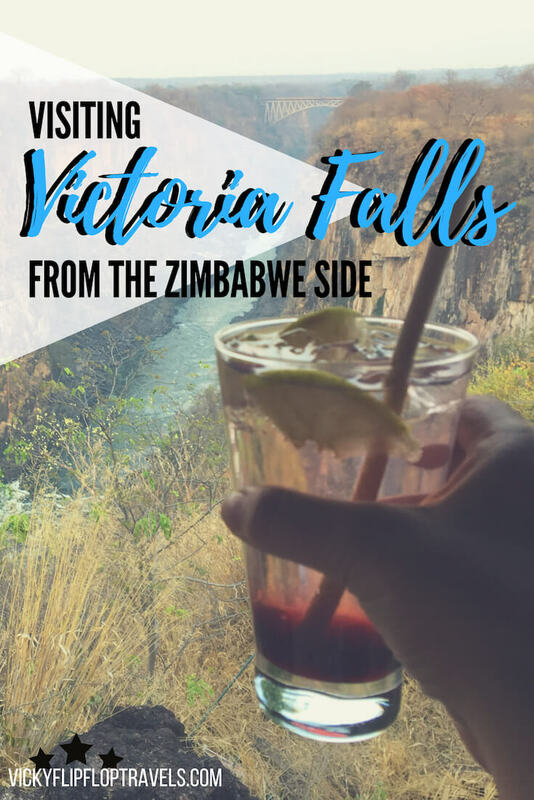 Viewpoint 6 – best view of Devil’s Cataract and Livingstone’s statue is visible above the falls. 7. 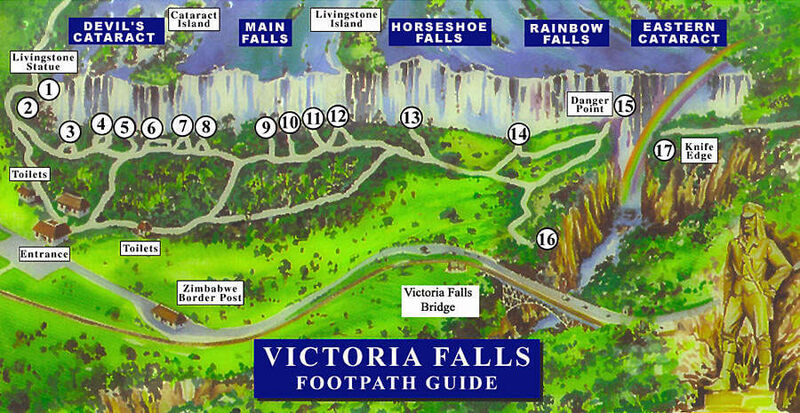 Viewpoint 7 – best views of the main falls, possible to see the river at the bottom of the gorge. 8. Main Falls – apparently incredible during the best season. 11. Viewpoint 11 – this is the point where Livingstone first saw the Falls. 14. Rainbow Falls – the highest point of the Falls. 15. Danger Point – leads along the cliff edge, and stupid people risk their lives looking down. Saw it myself. 16. Boiling Pot – view to the turbulent waters far below. Bridge Viewpoint – great view to the Victoria Falls Bridge linking Zimbabwe and Zambia, locally known as the ZimZam. We’d had a tip off from one of Helen’s friends about the Lookout Cafe. It was just behind the exit to the Falls – walking distance – and it looked out over the Gorge to the ZimZam Bridge. Gawd, the views were incredible – an amazing start to my Africa trip. Look into the distance at the ZimZam Bridge on the pic above. Cool hey? We had a (grim) gin cocktail and an iced coffee and admired our incredible world. Neither of us really fancied sitting at the Lookout Cafe in the dark eating so we went back into town to another place we’d been recommended: Three Monkeys. 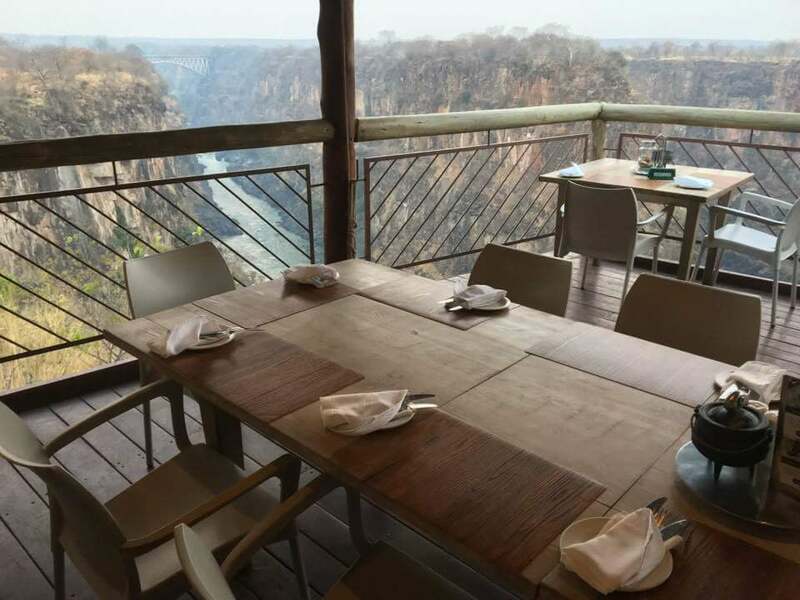 Despite being waaaay more expensive than the average Victoria Falls area eatery, the whole place was booked up so we ended up perched on a bar table, in the dark. The rest of the restaurant was really pretty though, with fairy lights and this sign that I fully approve of, just need to get rid of that ‘Falls’ bit. I don’t know what number meal I was on that day – always weird when you’ve been travelling – but I ended up ordering a burger, and Helen, a pizza. Food was decent, nothing too special. And so we went home via another backpackers Helen wanted to check out: Shoestrings Backpackers. We had a few drinks while listening to The Beatles blasting out. All good fun until two guys came over to talk to us / try to sell us weed /get our phone numbers / preach at us about feminism / then try to get our numbers again. Aaaaand, so, after being awake for more than 24 hours I decided it was time for us to go home and sleep. And we did. Have a listen if you’re planning this trip! The next morning we had a bit of breakfast, chatted to some fellow backpackers in the hostel and then got a taxi to the border, ready for our next adventure in Zambia. 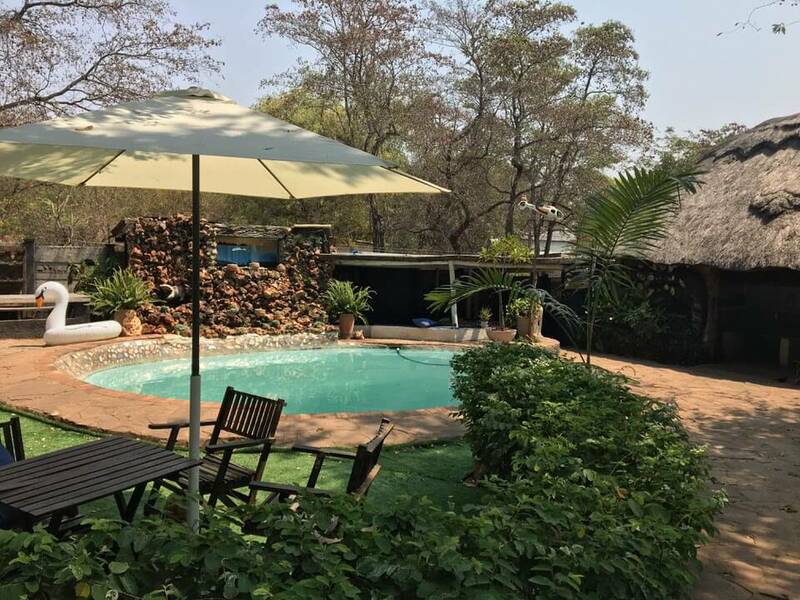 I stayed at the Victoria Falls Backpackers in a private room with a shared bathroom. It was a cool place with Wi-Fi, a pool, food options and a beauty salon. 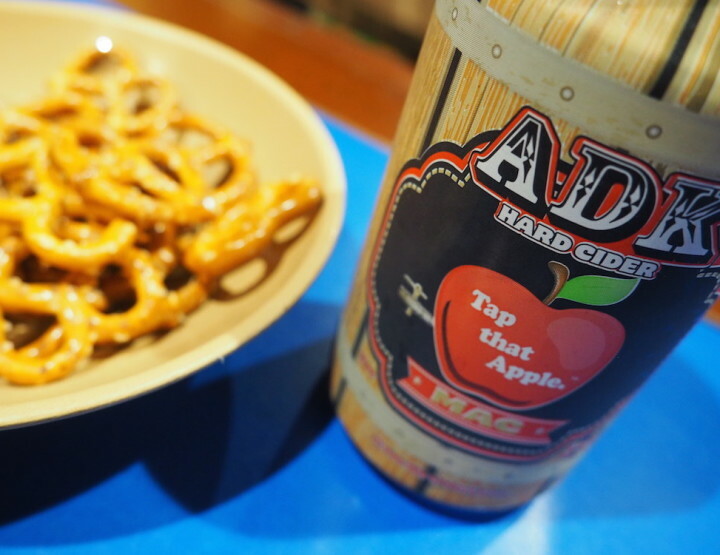 As the name suggests it’s one for the backpackers, and I liked it – I have no negatives about my stay there. 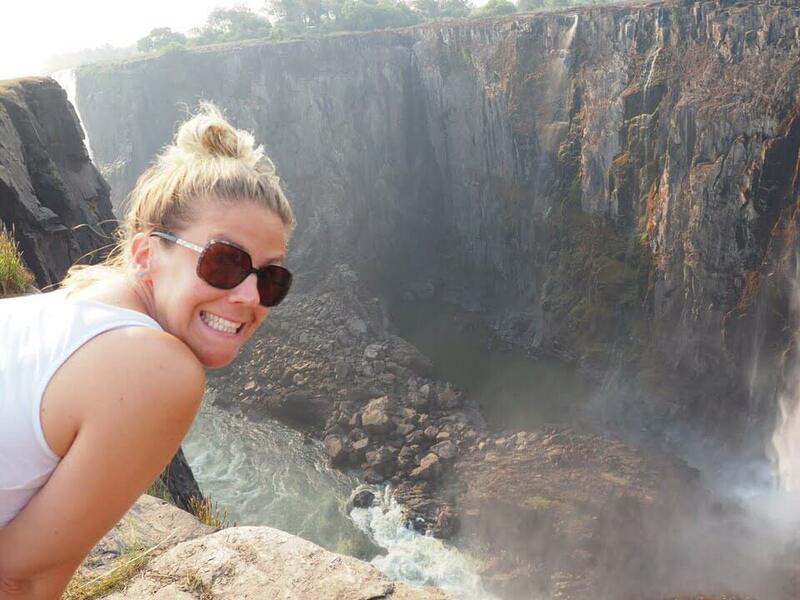 It was close to Victoria Falls, and during the day you could walk if you could hack the heat. We chose not to. It’s always advisable to get a taxi at night. When we went out for the evening the Backpackers even gave us a phone to call them when we wanted picking up – never had that in a hostel before! 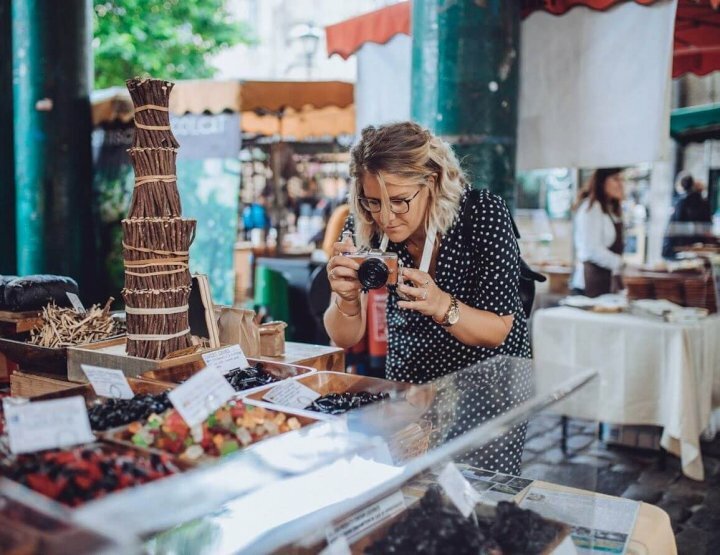 Don’t forget to budget for your Zimbabwe visa too, it was $55 | £42. 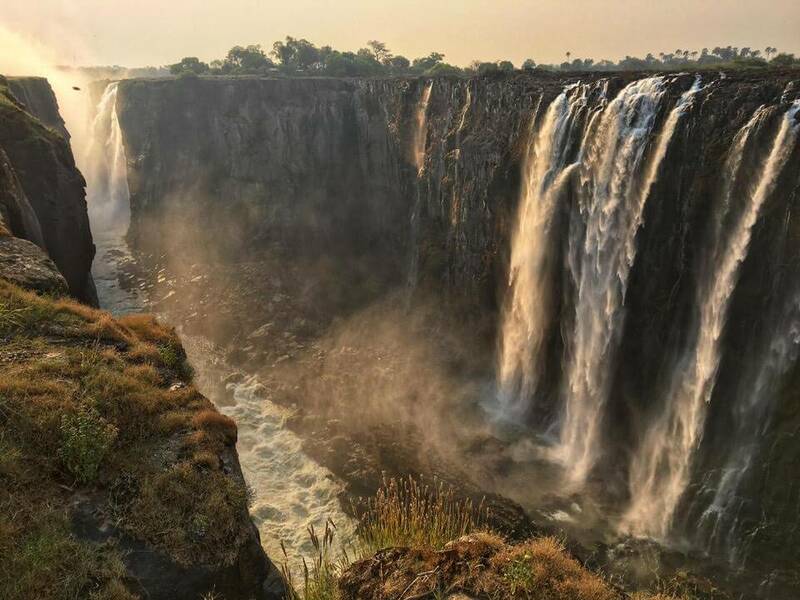 If you’re travelling on to Zambia you can get a Kaza visa which means you won’t have to pay again. I paid £531 for a return flight from London Heathrow to Victoria Falls in Zimbabwe, and then back from Blantyre in Malawi to London Heathrow. 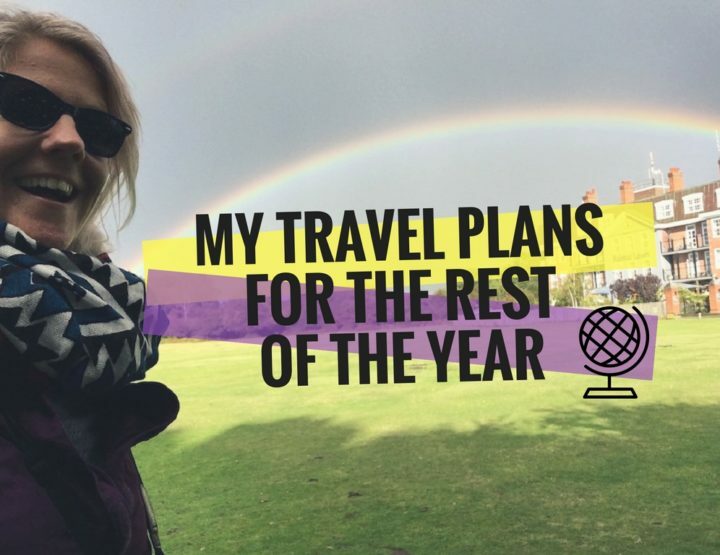 I travelled with Ethiopian Airlines, basically because they were the cheapest on Skyscanner – my flight search engine of choice. 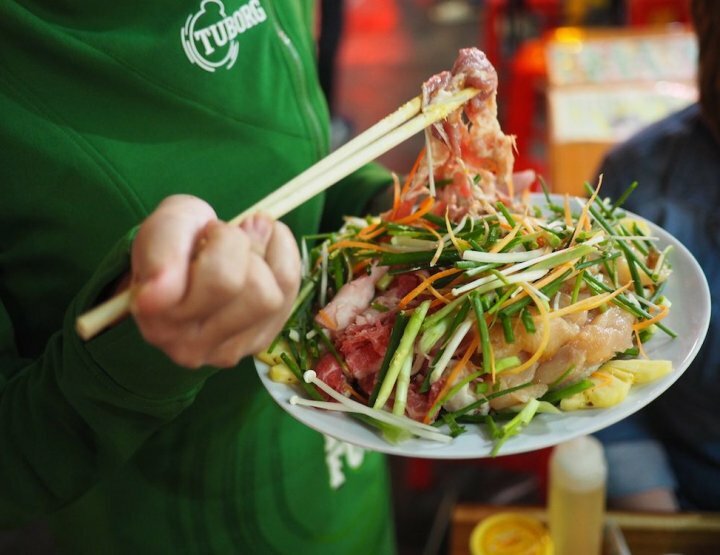 I was impressed with the service – nice new plane and good food. All I need. Had a 90-minute layover in Addis Ababa Airport in Ethiopia on the way there. The transfer to the Backpackers was 20 minutes, and $15, booked through the Backpackers, rather than the $30 I’d been quoted at the airport for the same journey with the airport taxi firm. 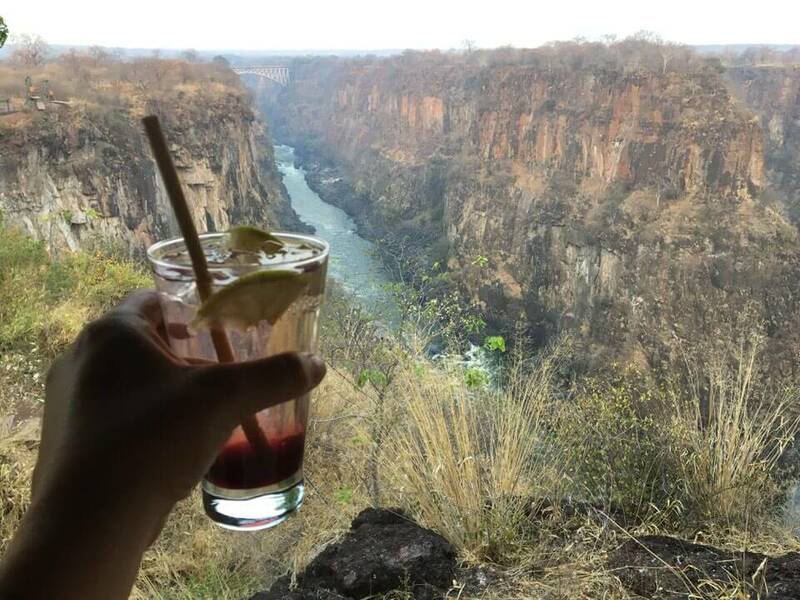 Any questions about the views of Victoria Falls from the Zimbabwe side?